This November, as the world pauses to remember the events of the First World War on the centenary of the Armistice of 11 November 1918 that drew it to its close, Sotheby’s will bring together a group of works that illustrates the tremendous and varied impact of the War on the artistic production of those whose lives it transformed. Incorporated into the Impressionist & Modern Art Evening Sale in New York on 12 November, the offering will assemble works that capture the period from immediately prior to the outbreak of the war through to its aftermath, together telling the artistic history of that momentous period. Highlighting this group are important works by Marsden Hartley, Ludwig Meidner and Franz Marc. The works will be presented under the moniker ‘The Beautiful and Damned,’ in reference to the 1922 novel by F. Scott Fitzgerald – the title of which alone captures the vicissitudes of the time. Marsden Hartley, Pre-War Pageant. Estimate in the region of $30 million. 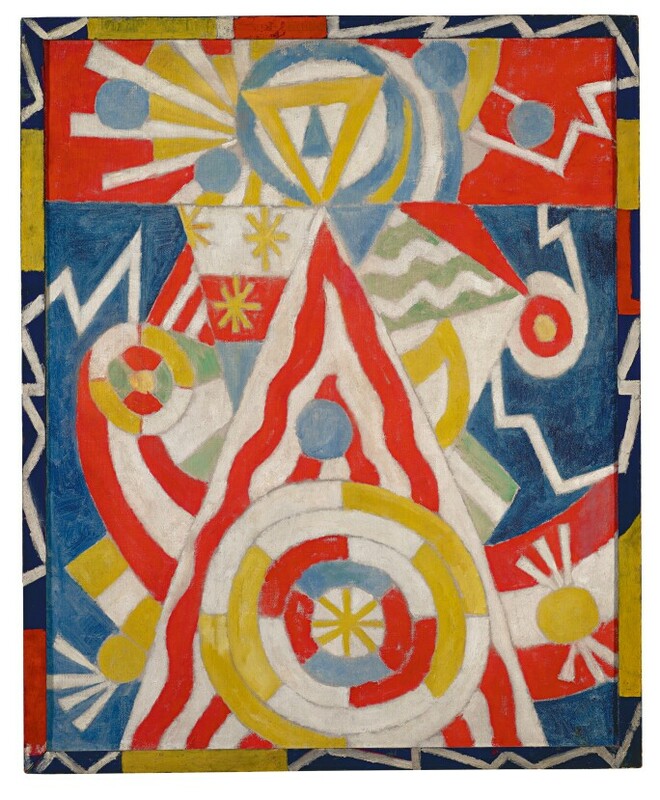 A true masterpiece of Modern art and the finest example of the artist’s renowned Berlin Pictures remaining in private hands, Marsden Hartley’s triumphant Pre-War Pageant represents one of the first examples of an American artist working in a purely abstract idiom. Radically melding diverse influences including Cubism, German Expressionism, Native American Art and Mysticism, the groundbreaking work captures the tenor of Berlin and Hartley’s emotional response to the city that he loved. Ludwig Meidner, Apokalyptische Landschaft (Apocalyptic Landscape) (recto). Estimate $12–18 million. Ludwig Meidner’s dual-sided painting Apokalyptische Landschaft (Apocalyptic Landscape), estimated to sell for $12–18 million, was executed in 1912 near the brink of the Great War. The arresting and cataclysmic urban scene reflects the social, political, emotional and artistic upheaval in Germany at the time. In stark contrast, the verso depicts a delightful and assured portrait, Junger Mann mit Strohhut, featuring an unidentified young man reading in a smart blue blazer and jaunty straw hat, enveloped in the joy of life afforded during the pre-war Edwardian era. Ludwig Meidner, Junger Mann mit Strohhut (verso). Estimate $12–18 million. With its spectacularly rhythmic composition, comprised of dazzling, overlapping angular areas of color, Kühe explores the central subject of Franz Marc’s oeuvre – the animal world. Executed in 1912, at a crucial moment in his career, immediately following the formation of Der Blaue Reiter – the artistic movement that Marc co-founded with Wassily Kandinsky in 1911 – the semi-abstracted treatment of the figures, coupled with the richly contrasting colors of bold blue and vermillion that reject the naturalistic use of color, epitomizes the profound contributions of Marc’s oeuvre to the emerging modernist aesthetic at the turn of the twentieth century. The Beautiful and Damned works will be incorporated into the Impressionist & Modern Art sale on 12 November.